Quidditch has come along way since its birth in the mind of Harry Potter author J.K. Rowling. The once only fictional sport was introduced to the public when the book series debuted in 1997, but it has since been brought to life by players around the world. Quidditch now boasts an international governing body and teams in over 20 countries, according to The Guardian. With the inaugural European Quidditch Games taking place this weekend in Sarteano, Italy, the growth of the sport begs the question of whether we may one day see Quidditch in the Olympics. In an interview on NPR, Karen Kimaki, tournament director for the European Quidditch Games, explained that Quidditch started out being played mainly by Harry Potter fans. Like in the books and movies, players straddle broomsticks, use quaffles to score goals, dodge bludgers, and play until a seeker catches the snitch from the snitch runner. And it's not easy. A member of the UK squad, Jan Mikocajczak, told The Guardian, “Other than the fact we’re not flying, it’s full contact and quite rough, just as it was in the books,” he said. Yet the sport sometimes struggles to be recognized as such, unfortunately at the expense of its literary tradition. Kimaki explained that some players don't want to be associated with the books. "[T]hey want to be taken seriously," she said. "They consider this an actual sport." 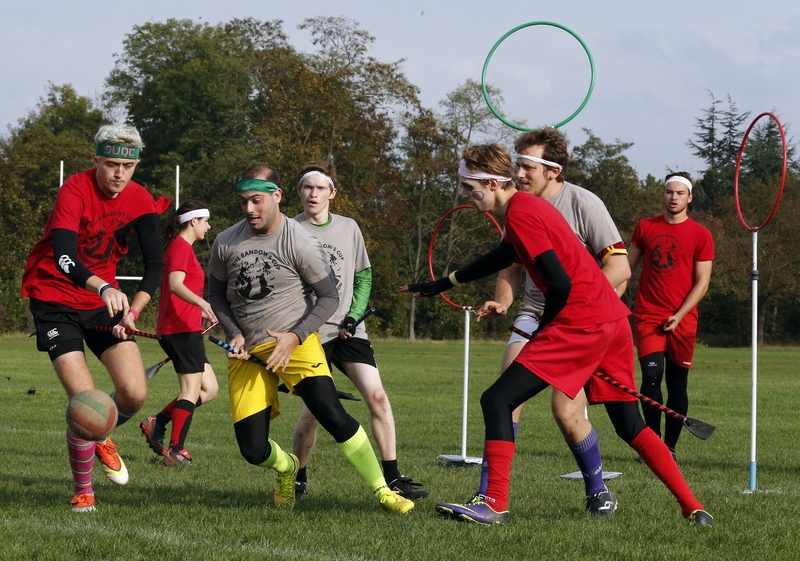 As Quidditch continues to expand its international presence, it's becoming harder to argue it. The European Quidditch Games includes 12 countries, from Norway to Turkey, and the International Quidditch Association (IQA) has held the Global Games every two years since 2012. There's even an 170-page rule book. Becoming recognized as an Olympic Sport by the the International Olympic Committee (IOC) would definitely provide validation. Per the IOC's requirements, it would need to be overseen by an international non-governmental organization (check) and follow the follow the rules and codes set by the Olympic Charter. The IQA would ultimately need to petition the IOC for this formal acknowledgment, but that alone wouldn't be enough to get it in the Games. Typically, the IOC adds new sports only as others are discontinued. For Kimaki, whether or not that happens isn't important. "For me, I don't personally care if we become an Olympic sport," she said. "I feel like that's a form of recognition I don't necessarily need to have to enjoy the sport itself." An Olympic sport or not, and even played by muggles, Quidditch is still magical.